Good morning! You may have already seen this post over at Life Made Lovely as part of Heather's new Room Made Lovely series but I wanted to have pictures of my girls' updated room on my blog so here's the post I shared over there. I started working the room when I was pregnant with my first girlie. You can read about how it all came together here. Now we have two girls and they share, or will share as soon as we move Little Sister in there, this room. In creating their room, I wanted it to be place for them to call their own, to have fun, feel safe and grow in. I wanted to fill their room with a whole lot of love and awesome to remind them how special they are. I like mixing bright colors and different patterns but I also know the girls will grow in and out of color trends so I have kept the main things like the walls, bedding and furniture pretty neutral so I can easily update the room by changing pillows, blankets, artwork, etc. Let's head on in, shall we. When you enter, your greeted by Sweet P's bed. Sweet P is the nickname, I think first interwebly (new word?) given to her by her aunt, that I use online so her whole life doesn't pop of if you google search her real name. Anyway, this is her big girl bed. It used to be the bed I slept in as a little girl but I updated it with a few, fresh coats of spray paint. 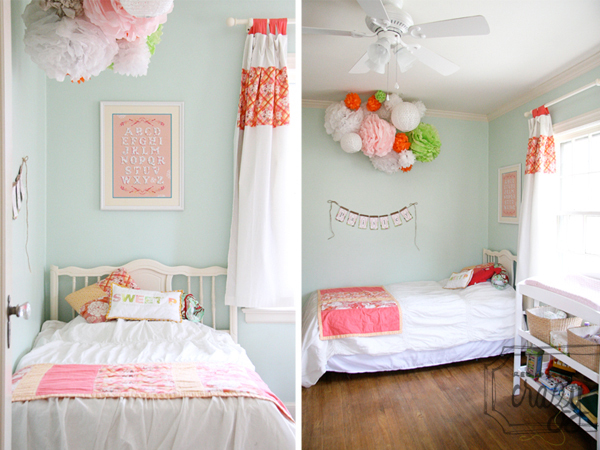 The pom-poms and name banner hanging above her bed were keepsakes from her baby shower her auntie threw me. I love the pop of color up there. The blanket was sewn by my mom for her crib when she was a baby and now rests at the foot of the bed. 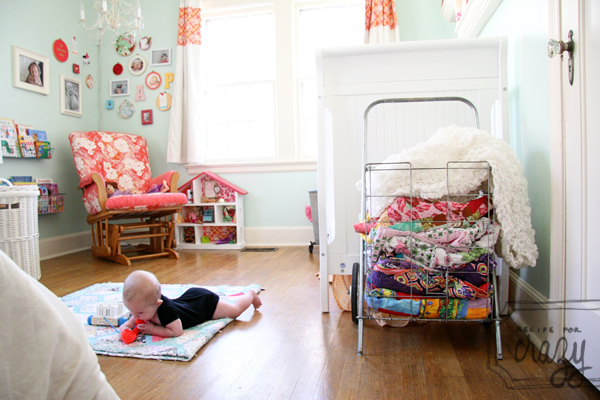 The combination of fabrics in the blanket are used throughout the room, as you will see. 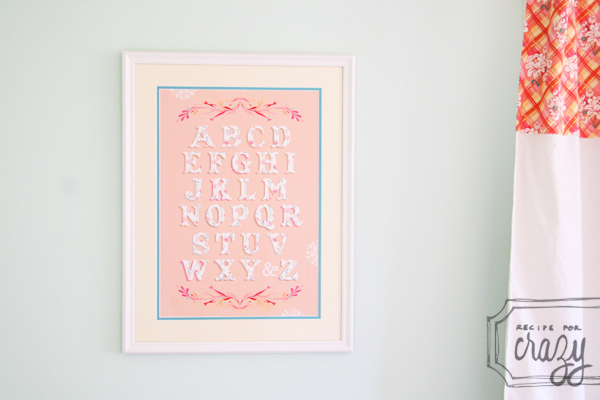 I'm a graphic designer and love a good print so when I saw the alphabet print designed by Katie Daisy, I instantly fell in love with it. It's funny now that my two year old is learning her letters because I'll hear her over the baby monitor, when she's supposed to be napping, finding different letters she's learned. On to the rest of the room. It's not a large room so I'll be very thankful when my girls are out of diapers so we can get rid of that changing table! But, for now it's filled with necessities and the bottom shelf stores some toys and books. I call the far corner the reading nook. My mom recovered the glider and it sits under a chandelier my dad found for Sweet P. I found some wire baskets at a flea market and used those to hold the girls' books. 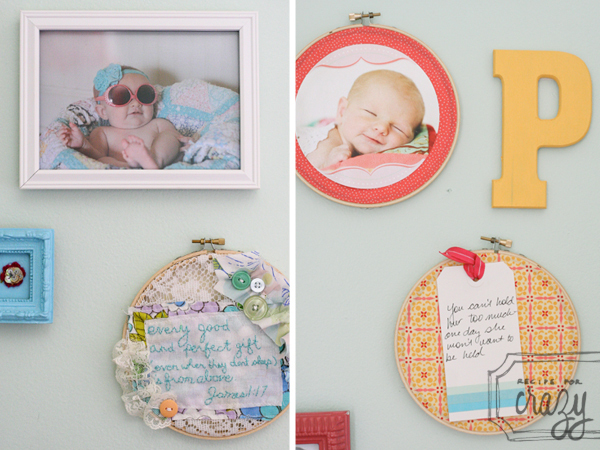 The wall is covered with photos of my girls as newborns - taken by their aunt, little keepsakes from showers and birthdays and a hoop embroidery thing I made reminding us to be awesome each day. The other side of the corner the the hoop art wall. I'm a sucker for hoop art. It's easy to customize, change and mix up. Anyway, there's a mix of memories up there. 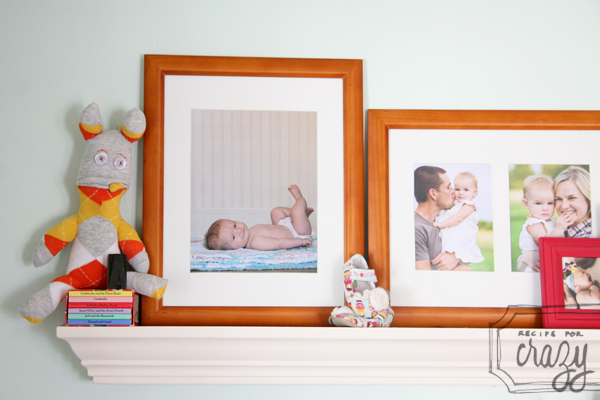 Pictures of the girls, letters for their names, Mother's Day gift from a friend, more keepsakes from showers and pictures from their birth announcements I designed. Opposite that wall is where Little Sister will sleep. Above her crib is a birth day quilt made by a friend for Sweet P and shelves filled with goodies for me and the girls to look at! Toys get tossed in an old metal mop bucket and the stuffed animals are kept in another bucket. Frames with more pictures taken by my sister, some of my old books and Sweet P's first shoes. 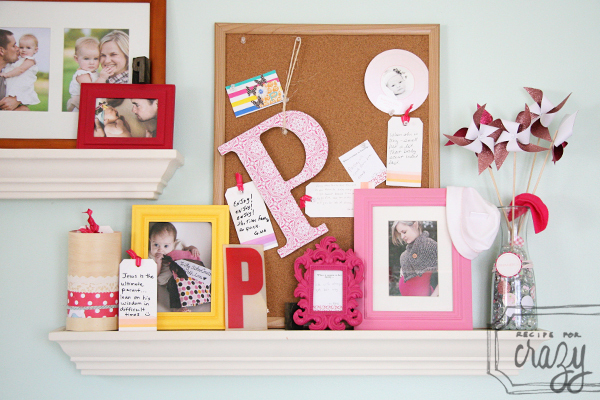 The other shelf has a cork board for keepsakes, more pictures of the girls, a picture my sister took when I was pregnant with Sweet P and more notes from the baby shower. There are some very talented ladies in my family. My grandma and aunt have both sewn quilts for the girls and I wanted to put them in something to store them but where you could also see them. My sister wasn't using her wire cart so she gave it to me! Perfect for quilts!! Oh hi, Little Sister! You can also see the doll house my sister decorated for Sweet P on the back wall. Barbie and Rapunzel usually hang out there. So that's my girls' lovely room. Thanks for stopping by and checking out my little space and thank you, Heather, for having me! 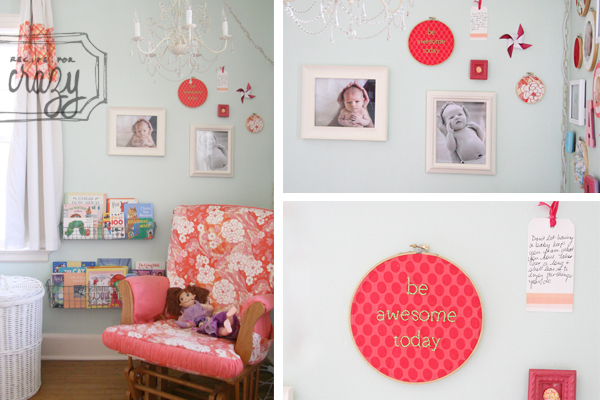 Thanks for sharing your girl's room, I love that it's so thoughtfully put together, but also REAL! 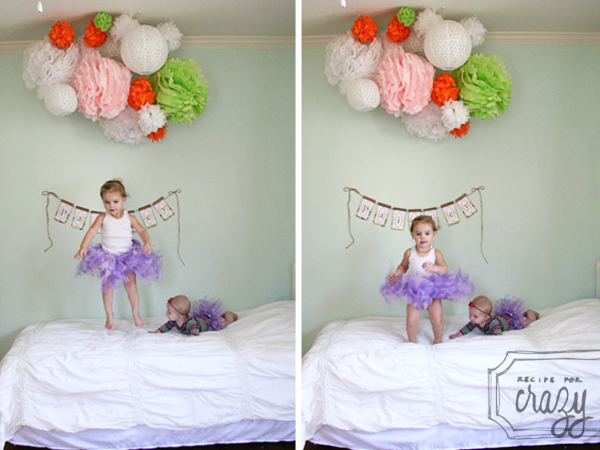 :) I love seeing how you made the pom-poms work along with the ceiling fan. I've been thinking about doing the same thing, but wasn't sure how it would look together. Now I know, it looks great! What a gorgeous room! I absolutely love it. Love love love their room. I'm hoping to use some coral in girl #2's nursery, so if you have any names of the fabrics in the room I would love to hear them. Or where they were found. I'm on the hunt for coral! i love it lesley!! i want to live in it! 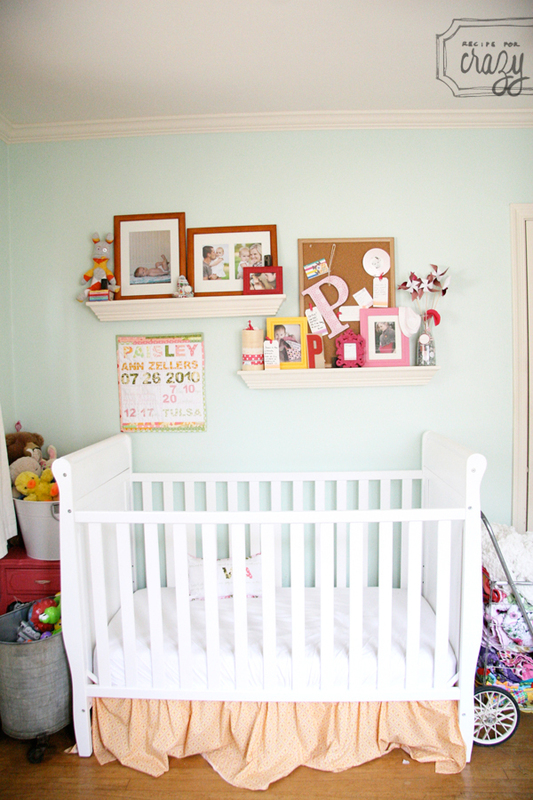 I plan on doing a similar color scheme with Kiera's bedroom when she gets older, if she still likes the "rainbow" colors. 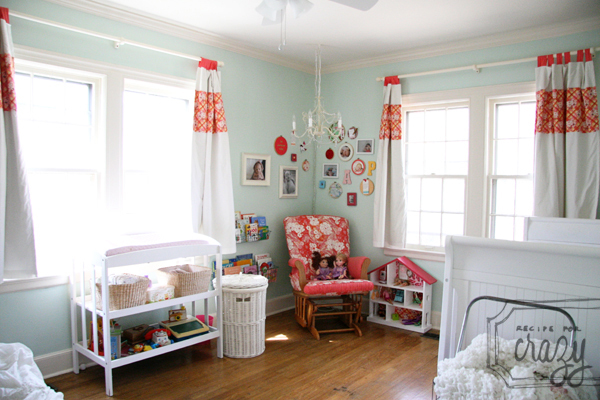 I love the pale blue walls and the orangish red curtains, rocker, etc. WOW!! So happy and pretty!! 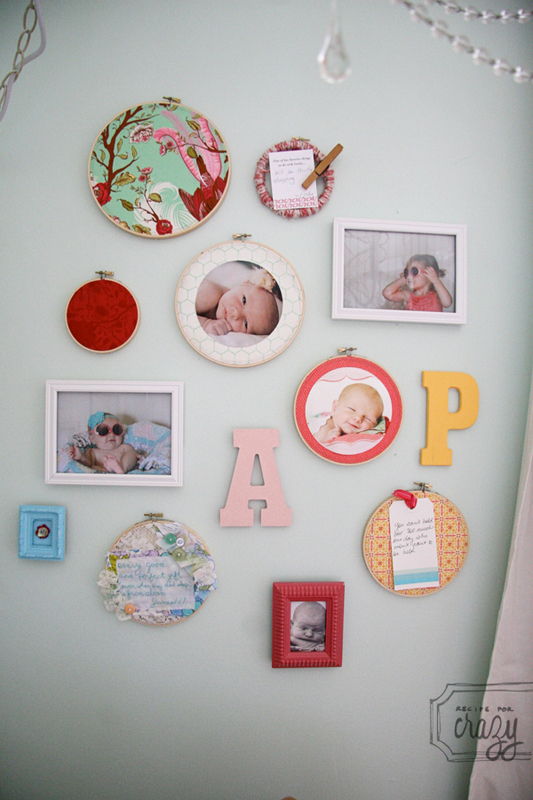 Sweet P's full name is in this post in a picture of the crib wall.